The top crushed stone-producing company in the United States, Vulcan Materials Co., would not be the mega-producer it is today without the vision of Charles W. Ireland, who developed a plan after World War II to expand his family company, Birmingham Slag. In the early 1950s, Ireland saw an opportunity for Birmingham Slag to became a major supplier of the crushed stone that would increasingly be in demand for President Dwight Eisenhower’s $175 million interstate highway system. Ireland, however, knew his company could only play a major role in the system’s expansion if it grew quickly. Becoming a publicly traded company was one way to achieve such rapid expansion. Ireland orchestrated a merger along with Barney Monaghan, the company’s outside legal counsel and longtime advisor, to purchase New Jersey-based Vulcan Detinning Co., which was being traded on the New York Stock Exchange at the time. Birmingham Slag made the acquisition on Dec. 31, 1956, officially incorporating Vulcan Materials Co. Initial shares sold for $12.69, and 13,800 shares were exchanged after the first five days of trading. Over the next few years, Ireland steered Vulcan through a series of mergers and acquisitions that elevated the company into the national spotlight. In 1959, he appeared on the cover of Business Week magazine and was featured in an article that praised his role in the creation of the company. “Charles was a man who operated with vision and imagination, and was not afraid to stick his neck out for something he really wanted,” Monaghan once said. Ireland was actually part of the third generation of his family involved in the business. Vulcan’s roots trace back to 1910, when Henry L. Badham and Solon Jacobs founded Birmingham Slag. Ireland’s grandfather, Charles L. Ireland, purchased the business from Badham and Jacobs in 1916. He turned operations over to three sons years later. 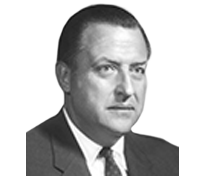 In the 1940s, the company passed on to William C., William R., Glenn and Charles W. Ireland, who remained active in the business until 1983 and served as Vulcan’s chairman of the board for many years. Ireland died in 1987, but his imagination and vision set the stage for Vulcan’s success as a public company.